.... "In the Caribbean, close to Barbados!" Barbados was an island I'd visit, staying at the Hilton Hotel during Easter break as a child since my mom had studied at the Barbados Hotel School prior to my birth. In fact, she participated in the very first Crop Over festival. So she gave me a lil' Crop Over history below. 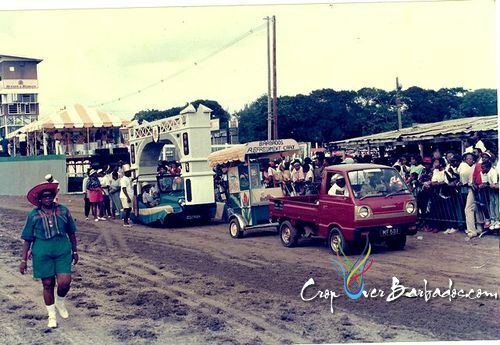 The Barbados Crop Over Festival first started around 1973-75 (I checked it was 1974 to be exact!). It was an attempt by the hotels to attract guests to the island in the off season. It was done at the end of the Sugar cane season, hence the name "Crop Over". Barbados, which we in the Caribbean call "Little England" had always been a British Colony before becoming independent sometime in the 60s. So Barbadians at the time were very "British"/Anglican. Quite unlike their Caribbean neighbours who had French and Roman Catholic backgrounds which was then the foundation of Carnival. For Catholics, Carnival, at it's original time - 2 days before Ash Wednesday, was the time to break loose and have a good time before the 40 days of lent. So Barbadians at the time wanted to use the same principle not in a religious sense but as it related to their culture, and so "Crop Over" was born. Since the hotels were involved in the initiative, their initial concept was to have a "Donkey Cart Parade" through Bridgetown with carts sponsored and decorated by the hotel staff. A very 'correct' and British idea, you have to admit. lol. 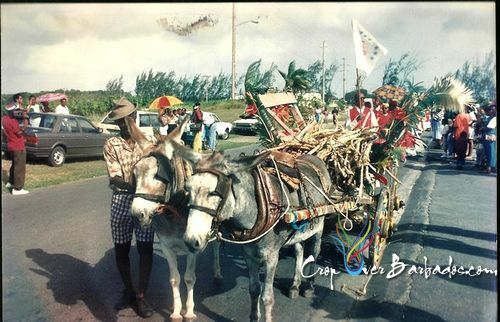 Donkey carts were a familiar sight at the time on Barbadian roads hauling all sorts items including sugar cane. At that time I was a student of the Barbados Hotel School, interning at The Barbados Hilton on weekends. When I arrived to work one Saturday, the staff were outside decorating our donkey carts. If memory serves me correctly, we had two carts in the parade. There were no sequins or feathers just flowers from the Hilton Garden; allamanda, bougainvillea and hibiscus. We wore no costumes and we did not dance either. We just 'chipped' down the road from the hotel through I think it was Bay Street. I cannot recall where along the way we met up with the carts from the other hotels and a "Tuk" band. A tuk band of kettle drums, flutes and "shak-shaks" (the Caribbean maracas). Listen here. Only then did I discover that a few of my other fellow students who were interning at other hotels had also been co-opted into the parade all the way through Broad Street in the capital of Bridgetown. The Saturday shoppers and many others stood by and cheered. It was lots of fun. To my amusement when I returned to Saint Lucia, Primrose Bledman, now deceased, a Carnival enthusiast in Saint Lucia, met me one day and remarked that he had come to Barbados to witness "Crop Over" and what he saw were Saint Lucians, not Bajans. He figured they were too shy to participate in a Donkey Cart parade. He always commented every time we met how he thought that was funny. How far and what a beautiful show "Crop Over" has become today! 'Though I have never done Crop Over ... thanks to an attempt that I had made in 2008, asking my dad (parents) to baby sit my daughter, only two weeks after I had done St.Lucia carnival. I thought no problem, I'd be heading over to BIM (B'dos). Instead, I got reprimanded for having my priorities all wrong, as a wife and mother of a then toddler. ... And I've mentioned in the past, my mom calls me her 'free-spirit' and my dad uses 'defiant' to describe me. So defiantly, I left St.Lucia, did not return to my home which was then in Vermont, but headed straight to Toronto for CARIBANA which also is usually the same weekend as Crop Over. ... And I have been enjoying CARIBANA ever since. LOL! 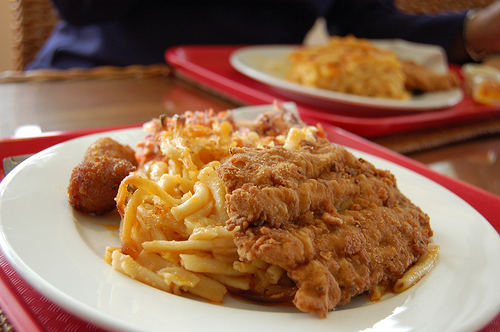 Barbados is always in the back of mind due to my fond childhood memories. Just such a beautiful flat island which just felt so foreign, unlike St.Lucia. Oye, the macaroni pie and fried flying fish from the Cave Shepherd cafeteria on Broad Street ... YUM. And from the time I know myself, CBC (Caribbean Broadcasting Corporation) always broadcasted in St.Lucia. Last year, while at home for Lucian Carnival and pregnant ... only a couple of weeks later, I watched from home the Crop Over parade to see if I'd see any of my friends. All I remember was a tropical storm of sorts which was threatening St.Lucia by the time it got to us! 'Cause I was stuck in St.Lucia due to flight cancellations. Thanks to BWIA (now Caribbean Airlines) and LIAT, I have been intransit, delayed and overnighted on the island. I've had B'jan customs threaten to take my feather headpieces while intransit between Trinidad and St.Lucia. I did a day trip to the US Embassy in December 1999 which set me on a path to get US Citizenship. I just could not believe how the embassy treated us folks. I swore never me again! Even one christmas, while heading home to St.Lucia from college, two Vincy (from St.Vincent) boys and I made certain the airline put us in a hotel for the night. Well when we arrived the hotel, Alison Hinds was performing at a wedding. Next thing, we were enjoying the wedding. Those were the days when her band Square One's hit song was 'FALUMA.' The days of Spirits Lounge, a West Indian club off of the 836, near Miami International Airport. ... And now with an ever growing list of B'jan friends that we party with since living in the DMV (DC, Maryland, Virginia area), I keep telling my husband we need to go! Even Trinidad Carnival Diary blogger Saucy suffering from Trinidad Carnival tabanca has commented about counting down her days till Crop Over 2012. And recently posted "It Ain't Over Till It's Cropover ... The 2011 Review FINALLY!" Even the following guides coincidentally dropped in my lap. When a Trini says "we fetin'" ... I know it's a real' good time, so trust this, Welcome to Crop Over! A Calendar/Guide. 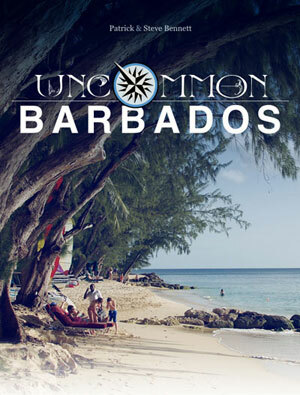 And in this day and age of technology, this multitouch travel guide for Apple iBookstore crammed with over 85 virtual pages of content, over 100 original HD photographs, the Uncommon Barbados guide curates suggestions of the top things to Do, Eat, and Drink on Barbados. Enjoy Barbados... for me! LOL! Haha ... girl, will just have to do it! I loved Barbados, long before my love for Trini!